You require flexibility, scalability and granular control from your messaging security infrastructure. PureMessage for UNIX delivers just what you need. You get all the advanced threat and spam protection you'd expect from SophosLabs. And we equip you with all the fine-grained management controls you require. PureMessage for UNIX is not just an email security solution. It's a platform for message security that can be tailored to meet the needs of even the most demanding operations. You get a platform designed with complete customization and extensibility in mind. You can modify, automate and customize system operations with the built-in tools and powerful scripting. You get a powerful policy builder with deep authoring capabilities including over 65 tests and actions and unlimited levels of nested rules. You also have full control over per-user and per-group policy elements. PureMessage for UNIX deploys on a broad range of UNIX platforms, works seamlessly in a multi-server cluster and with most SMTPbased messaging and email encryption solutions. It also fully supports IPv6 networks and integrates with external systems like LDAP directory services, custom web portals and much more. Our web-based management console provides granular custom controls over all policy rules. PureMessage for UNIX makes your job easier with flexible management options, whether you're managing the messaging for a large government or a higher-education institution, an enterprise business or your own service provider. You can build precisely the right delegated administration model to fit your organization's service delivery structure. And you can assign granular access rights based on the administrator's role or by domain, groups or individual users. We make it easy to run an in-house messaging service. Why rely on a third party SaaS solution when you could do it yourself? With PureMessage for UNIX, you can securely partition your customers with our built-in groups capability. Each group gets their own web management console for configuration, policy, reporting and quarantine management. Our streamlined administrator and end-user quarantine management is designed to get out of the way. It includes intuitive but powerful search options and task-oriented actions. 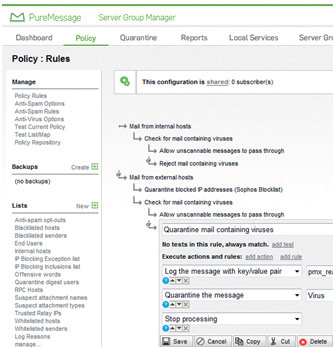 It also gives you full visibility into the message status and direct access to the mail content to make quarantine management less of a pain in those rare instances you need to use it. We help you get answers quickly and easily. Powerful message tracking with equally powerful search capabilities allows you to zero in on your target messages efficiently and effectively. We give you the capability to report on what really matters most. Use any of the 33 built-in reports or create your own based on custom policies to get instant visibility into the mission critical parameters that you need to make decisions and take action. Our global blended threat labs operate and capture thousands of new virus, spam and web threats 24/7. Threat analysis and advanced technology are critical for effective security, and our consistent 99.8% spam catch rate speaks volumes. Our engine uses a broad range of anti-spam technologies including reputation filtering, dynamic URL analysis, live lookups, heuristics, content finger printing, genotypes and more. We eliminate most spam even before our engine scans incoming mail. Our Sender Genotype technology stops spam based on the reputation of the sender, whether the unwanted email comes from a known offender or a new source. We protect you from the latest spam campaigns. Live Anti-Spam uses our cloud service to catch spam in real time and keep it out of inboxes. We block new threats at the gateway before they reach your mail servers. With our Behavioral Genotype Protection, you get the best proactive protection from zero-day threats. Each multi-tenant group has their own web-based console to manage their own quarantine, reporting and configuration. Appliances can be clustered for scalability and multi-site environments. 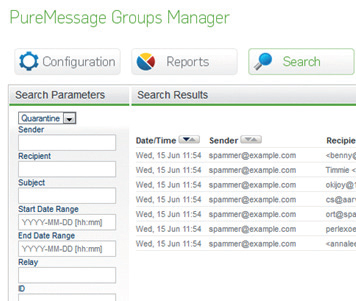 Download the Sophos PureMessage for UNIX Data Sheet (PDF). Download the Sophos Email Product Comparison (PDF). Download the Sophos Email Security and Data Protection Data Sheet (PDF).